I had already tried the full selection of paw sprays, and in fact I believe they were responsible for healing many of Boca's itchy spots when I first adopted her from The Bahamas. 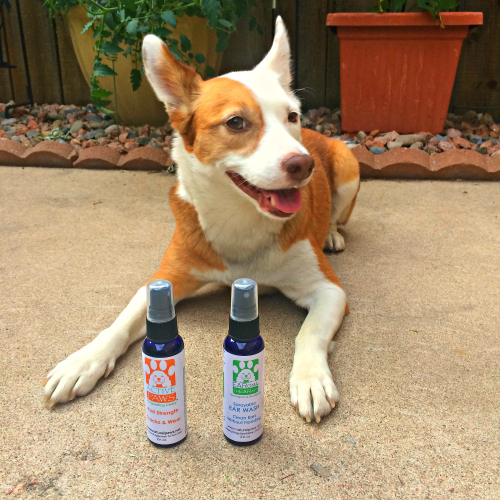 The paw sprays can help soothe dry, cracked paws and eliminate the irritation that can lead to licking and chewing paws. They contain such lovely, natural ingredients as chamomile, orange oil and cedar, We used Active Paws on our recent road trip through the desert, and the quickly absorbed, aromatic spray kept Boca's paws moisturized and comfortable in the harsh heat. It even provides a natural insect repellent! 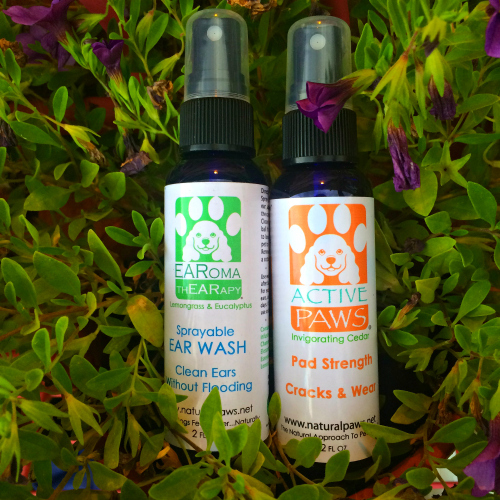 Another product I was especially excited about was the EARoma ThEARapy ear wash. Boca had such severe ear infections when she arrived from The Bahamas that the vet thought she might need her ear canals removed completely. Thankfully, we did not need to take extreme measures and got the infection under control, but I have to keep a close eye on the state (and smell) of her adorable ears. Regular ear washes seemed to aggravate her and filling her ears with liquid makes me nervous, so I was happy to try this spray which requires a minimal amount and leaves the ears smelling wonderful with the scent of eucalyptus, lemongrass and tea tree oils. Boca is such a good cooperative girl with this sort of thing, and we'll be incorporating this into our regular grooming routine. Disclaimer: I was provided Natural Paws products in exchange for my honest review.All opinions expressed are my own and I only publish reviews for products I feel comfortable using in the day to day life of my pets. 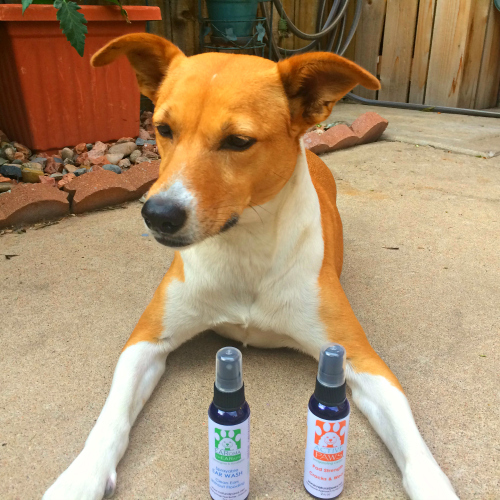 I love using natural products for my furbabies. I'm especially interested in trying their ear cleaner - I have three rescued Treeing Walker Coonhounds, and if you know hounds and their long ears, ear problems are common so it's necessary to keep them clean. I have tried a number of products but am still looking for the perfect one. Your paw product sounds interesting. My maltipoos have sensitive paw pads. I am most interested in the Natural Paws product. Ooh! I'd love to try the ear cleaner.